Schooley Caldwell was recently hired to lead an exterior renovation of the entire facade of the Rhodes Tower at 30 East Broad Street in Columbus, Ohio. At 41-stories and 629 feet tall, it is currently the tallest building in Columbus and the fifth tallest in Ohio. Schooley Caldwell was the architect for the partial roof replacement at the Vern Riffe Center, a 32-story building in downtown Columbus with 1.1 million square feet of space. Completed and occupied in 1988, it serves approximately 2,000 state employees. The complex also contains an 854-seat theater. Our scope of work involved designing repairs to the original roofing systems. This included onsite evaluations of the existing system as well as core testing. Schooley Caldwell first analyzed the building, the structure, roof equipment, flashings, building insulation, vapor barriers, and the roof membrane as part of the roof assessment process. Core sample testing provided the basis for the conditions of roofing membrane, roofing substrate, and roofing insulation, hazardous materials, and sealants. As part of the analysis, we evaluated potential roofing systems, insulation types and installation to formulate the best system available for the project based on both materials and costs. Having carefully estimated costs, we developed a plan based on the OFCC's $1.8 million construction budget. We assisted the OFCC with bidding and evaluating bids, and provided onsite construction observation. The project at Brasee Hall and Herrold Hall, both on Ohio University’s Lancaster campus, involved a partial roof replacement on each building. Brasee Hall originally opened in 1968, and Herrold Hall was built in 1976. The existing roofs were a built-up roofing assembly with an overlaid elastomeric sheet (EPDM) roofing system. The roofing membranes were completely removed and the insulation assembly was removed down to the existing metal decking. The new roof systems consist of rigid insulation, coverboard, and a new 60 mil EPDM roofing membrane. 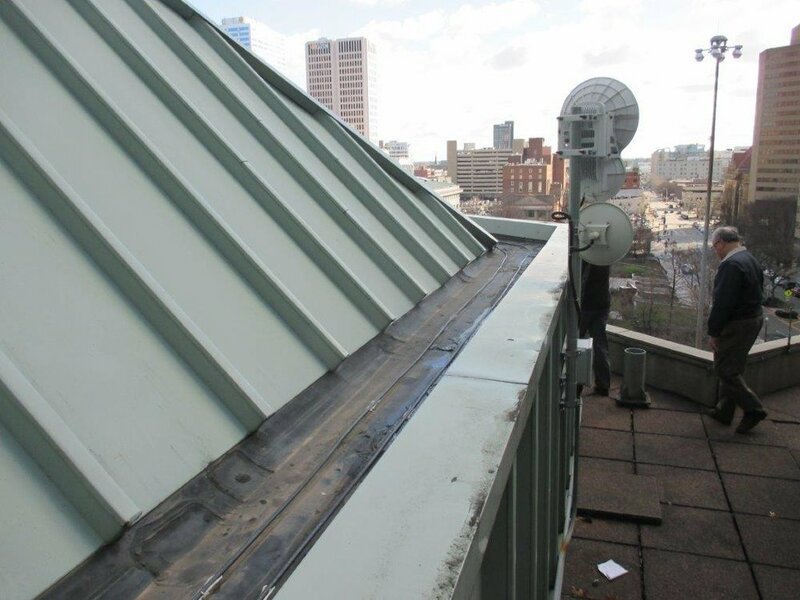 The work also includes new metal flashings associated with the new roofing. Since the completion of our full restoration of the Statehouse and the new Statehouse Atrium, Schooley Caldwell has served as the “Architect of the Capitol” under contract with the Capitol Square Review and Advisory Board, the state entity that is the official overseer of the Statehouse. We provide on-call services for all projects that take place at the Capitol, including maintenance, repairs, technical services, and capital projects. Schooley Caldwell (with Lerch Bates as Elevator Consultant) served as the Criteria Architect for repairs, upgrades, and replacements to seven elevators in five different buildings on OU’s main campus: Alden Library, Ellis Hall, Seigfred Hall, Clippinger Hall, and Kennedy Museum. We were responsible for evaluating the existing elevator systems, reporting our findings to OU, designing necessary upgrades and replacements, developing design/build documents for the project, and assisting with bidding and construction oversight. The existing elevators varied in type and size, and include service and passenger elevators, hydraulic and traction types. Several of the elevators recieved new controllers and upgrades to the machine rooms to bring them into compliance with the current ASME A17.1 Elevator Code, while all of them will received interior car upgrades. We were also responsible for working with the university to prioritize the recommended upgrades, taking into account budget constraints. Schooley Caldwell managed upgrades of the existing 4” pneumatic tube system in Rhodes Hall, Doan Hall and the James Cancer Hospital with a new 6” pneumatic tube system. The work occured in functioning patient care areas, nurses’ stations, mechanical rooms, pipe chases, and roof areas. 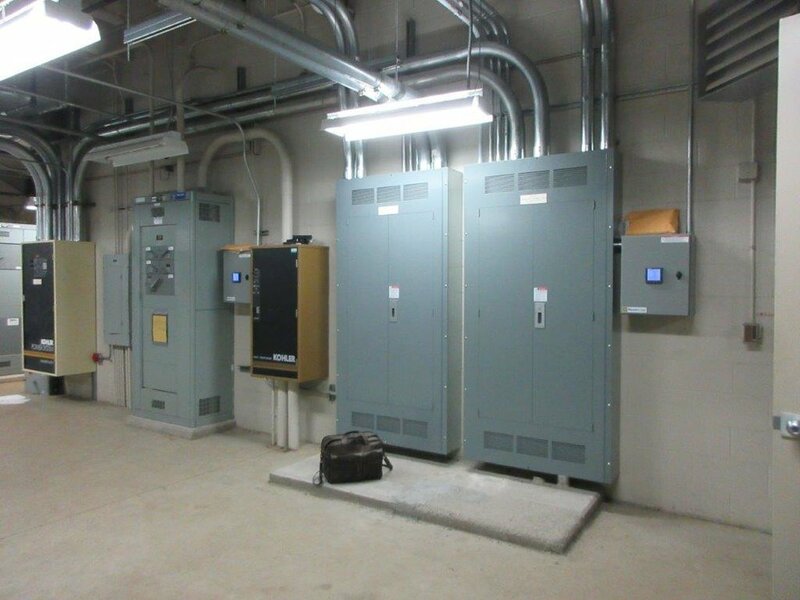 The design work included the removal and replacement of finishes required for access to the existing system for replacement, existing utility conflicts, and installation of needed utilities for the new system. This included electrical, telecommunications, mechanical and plumbing. New locations needed to be designed for the blower equipment. These areas were in the basement of Doan Hall and the Penthouse of the James Cancer Hospital. The portion of the Ohio University campus known as The Ridges consists of about 700 acres of land and about 40 buildings. 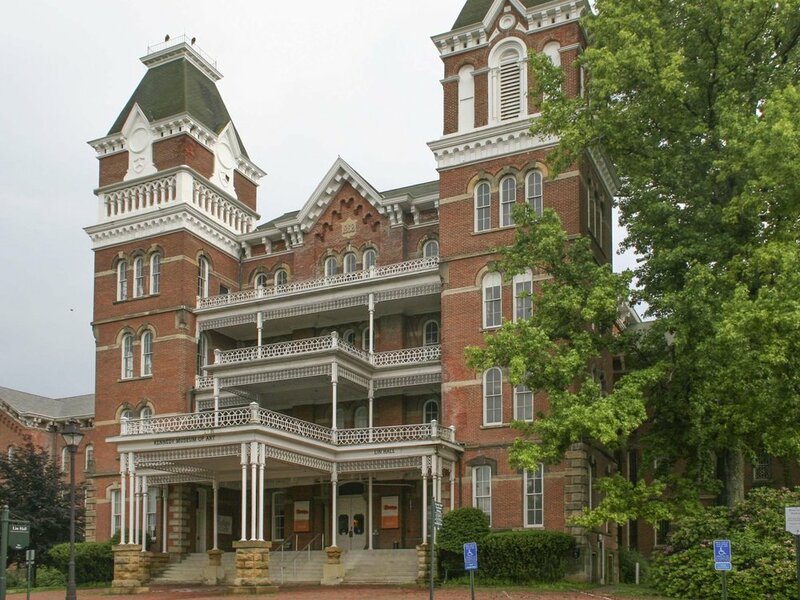 A former State Mental Hospital facility, the property was transferred to the University in the 1980’s and includes numerous historically significant buildings. While Schooley Caldwell was developing a Master Plan for these buildings, our physical assessments revealed that some buildings required immediate attention. Schooley Caldwell performed emergency repairs to seven of them, which included asphalt shingle and slate roofing repairs, and metal fascia, soffit, gutter and downspout repairs. The work remedied aspects of the roofing and roofing water removal systems that had failed and as a result were causing damage to the buildings. Roofing repairs to the asphalt shingle roofs consisted of patching and overlaying new shingles on the existing roof shingles. Some areas of shingles were removed to allow access to wood rafter, sheathing and fascia repairs. Schooley Caldwell also conducted masonry restoration and repairs to brick masonry and stone masonry facades at nine buildings. This elevator modernization project at WSU includes four elevators within Dunbar Library: 3 traction elevators and 1 hydraulic elevator. The traction elevators are 5-stop elevators and share a single hoistway, while the hydraulic elevator is a two-stop elevator in a separate hoistway. The project scope includes replacement of elevator hoist machine, controller, fixtures, and all M.E.P. upgrades to the machine rooms and hoistways. Schooley Caldwell recently completed an assessment of architectural, mechanical, electrical, plumbing, and fire protection systems. Lerch Bates assisted to develop the project budget and construction schedule for the RFP. The team will provide WSU with CDs, bid and award support, and construction administration until the project's completion in 2019.